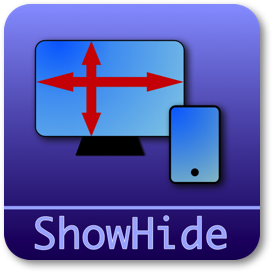 The ShowHide Stack lets you control the visibility of Stacks depending on browser width or browser height. 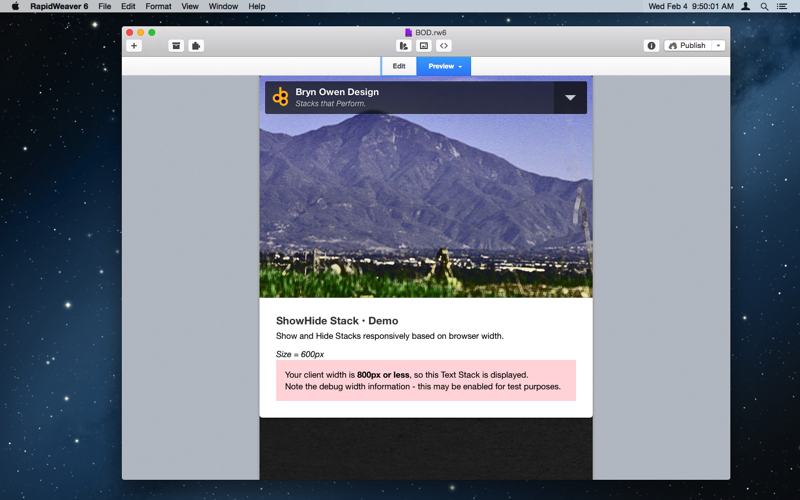 A handy debug mode shows the client width x height dynamically in case you need to test your responsive design. You may choose to show one or more Stacks above a certain width or height, or show them below a certain width or height. A very simple set of options control when the Stacks are displayed based on width, and whether you would like to enable the debug mode (handy for testing but should be disabled in your final Publish). Responsive size Show content in first stack area if client width or height is greater than this, otherwise show second stack area content. Check height, not width Enable this to test height and not width. The default is to check width, so this option is unchecked by default. Extra edit info? Enable extra information info in the edit window. Debug size in publish? Enable extra window size debugging info in the preview and published output. 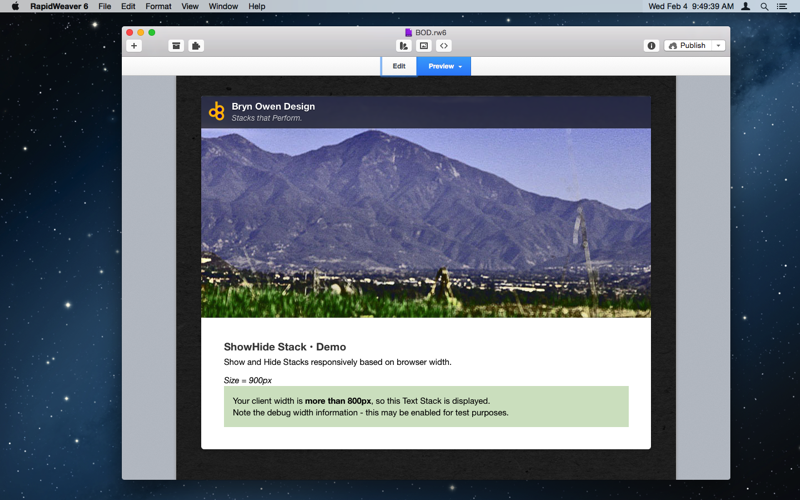 Your client width is more than 800px, so this Text Stack is displayed. Note the debug size information - this may be enabled for test purposes. Your client width is 800px or less, so this Text Stack is displayed. Note the debug size information - this may be enabled for test purposes. 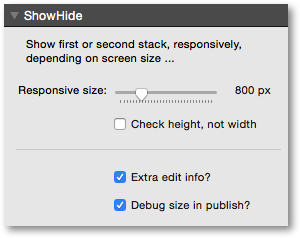 Your client height is more than 800px, so this Text Stack is displayed. Note the debug size information - this may be enabled for test purposes. 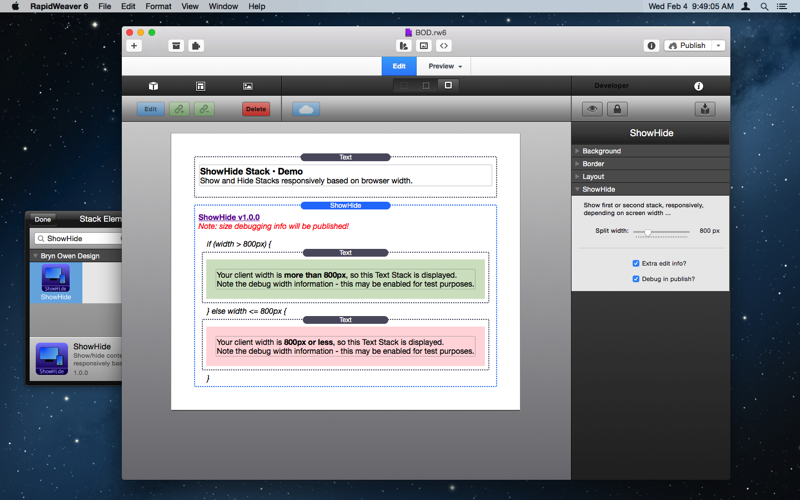 Your client height is 800px or less, so this Text Stack is displayed. Note the debug size information - this may be enabled for test purposes.